As I write this on a full-moon solstice, I am reminded of the work of Anne Baring, a Jungian analyst, scholar and wise-woman who speaks of intuitive “feminine” ways of knowing as LUNAR and intellectual “masculine” ways of knowing as SOLAR. 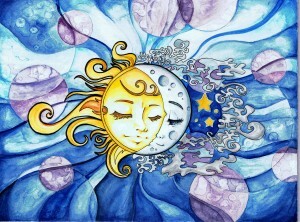 We embrace the intelligence of both our lunar and solar ways of knowing. It is another lens to view the work of Social Alchemy: To embrace the intelligence of both the lunar and the solar so that we may embody our highest selves, and best serve the vision for a thriving, emerging future. In W. Hartford CT, and in New Smyrna Beach, FL, two circles are gathering to prototype new ways forward for healing and social change. We are bringing together empathic + systemic understanding of Systemic Constellations, with the emergent process of Art of Hosting. Systemic Constellations help us identify hidden, misunderstood or misrepresented aspects of a system. Art of Hosting generates and moves the collective wisdom forward. As agents of change, when we learn to align ourselves with “what’s missing”, hidden solutions and resources become available to us. Our experience is that creating change in complex systems requires us to discover what is unseen in the system as we currently understand it. As agents of change, when we learn to align ourselves with what’s missing, hidden solutions and resources become available to us. How do the unprocessed wounds of slavery and colonialization perpetuate systems of racism and oppression? What are the hidden and misrepresented dynamics that maintain the unequal access to financial and other resources? How does our unexamined relationship to the earth affect climate change and environmental justice? We invite change-makers, constellation facilitators, educators, healers, and anyone who feels calls to create and move from inspired action. You do not need to be familiar with Constellations or Art of Hosting to attend. You will leave these retreats with refined tools, an inspiring new community, and the support you need to bring the work home. Creating an economy that supports healthy, sustainable communities. Join a ZOOM call hosted by Social Alchemy to talk about money – or more specifically, to discuss creative approaches to changing the current economic paradigm! CLICK HERE to register. You will receive an email with the call information after registration.